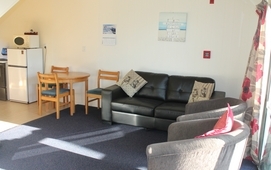 Moeraki Beach Motels is situated in the Village of Moeraki, just a short stroll to the beach. Enjoy the views of the harbour from your units. Moeraki is a picturesque fishing village waiting to be explored. It was originally a whaling station and also the first choice for the Oamaru Harbour. It has an abundance of history, some of which can be found on plaques along the Millennium Walkway, Whalers Lookout and Moeraki Centenary Park Monuments. We are the closest accommodation to a spectacular beach (100 metres), safe for swimming and play. To the left, in the distance over the bay, are the famous Moeraki Boulders. To the right is Fisherman's Wharf with the tavern across the road. Ahead, looking over the commercial, charter and pleasure boats at the end of the old wharf, is Fleurs Restaurant. Once again Fleurs Resturant has been reconised for her excellence in the top 100 Cusine Resturants in New Zealand.